Slavs can be further grouped by religion. Orthodox Christianity is practiced by the majority of Slavs. The Orthodox Slavs include the Belarusians, Bulgarians, Macedonians, Montenegrins, Russians, Rusyns, Serbs, and Ukrainians and are defined by Orthodox customs and Cyrillic script, as well as their cultural connection to the Byzantine Empire ( Montenegrins and Serbs also use Latin script on equal terms). Their second most common religion is Roman Catholicism. 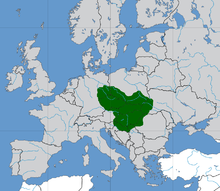 The Catholic Slavs include Croats, Czechs, Kashubs, Moravians, Poles, Silesians, Slovaks, Slovenes, and Sorbs and are defined by their Latinate influence and heritage and connection to Western Europe. There are also substantial Protestant and Lutheran minorities, especially among the West Slavs, such as the historical Bohemian (Czech) Hussites. The oldest mention of the Slavic ethnonym is the 6th century AD Procopius, writing in Byzantine Greek, using various forms such as Sklaboi (Σκλάβοι), Sklabēnoi (Σκλαβηνοί), Sklauenoi (Σκλαυηνοί), Sthlabenoi (Σθλαβηνοί), or Sklabinoi (Σκλαβῖνοι),  while his contemporary Jordanes refers to the Sclaveni in Latin. The oldest documents written in Old Church Slavonic, dating from the 9th century, attest the autonym as Slověne (Словѣне). These forms point back to a Slavic autonym which can be reconstructed in Proto-Slavic as *Slověninъ, plural Slověne. The reconstructed autonym *Slověninъ is usually considered a derivation from slovo (" word"), originally denoting "people who speak (the same language)", i. e. people who understand each other, in contrast to the Slavic word denoting German people, namely *němьcь, meaning "silent, mute people" (from Slavic *němъ " mute, mumbling"). The word slovo ("word") and the related slava ("glory, fame") and slukh ("hearing") originate from the Proto-Indo-European root *ḱlew- ("be spoken of, glory"), cognate with Ancient Greek κλέος (kléos "fame"), as in the name Pericles, Latin clueo ("be called"), and English loud. Ancient Roman sources refer to the Early Slavic peoples as Veneti, who dwelled in a region of central Europe east of the Germanic tribe of Suebi, and west of the Iranian Sarmatians in the 1st and 2nd centuries AD. 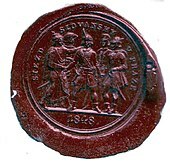 The Slavs under name of the Antes and the Sclaveni first appear in Byzantine records in the early 6th century. Byzantine historiographers under emperor Justinian I (527–565), such as Procopius of Caesarea, Jordanes and Theophylact Simocatta describe tribes of these names emerging from the area of the Carpathian Mountains, the lower Danube and the Black Sea, invading the Danubian provinces of the Eastern Empire. Around the 6th century, Slavs appeared on Byzantine borders in great numbers. Byzantine records note that Slav numbers were so great, that grass would not regrow where the Slavs had marched through. After a military movement even the Peloponnese and Asia Minor were reported to have Slavic settlements. This southern movement has traditionally been seen as an invasive expansion. By the end of the 6th century, Slavs had settled the Eastern Alps regions. Slavic linguistic unity was to some extent visible as late as Old Church Slavonic (or Old Bulgarian) manuscripts which, though based on local Slavic speech of Thessaloniki, could still serve the purpose of the first common Slavic literary language. Slavic studies began as an almost exclusively linguistic and philological enterprise. As early as 1833, Slavic languages were recognized as Indo-European. West Slavs originate from early Slavic tribes which settled in Central Europe after the East Germanic tribes had left this area during the migration period. They are noted as having mixed with Germanics, Hungarians, Celts (particularly the Boii), Old Prussians, and the Pannonian Avars. The West Slavs came under the influence of the Western Roman Empire (Latin) and of the Roman Catholic Church. East Slavs have origins in early Slavic tribes who mixed and contacted with Finno-Ugrics, Balts, and Caucasians. Their early Slavic component, Antes, mixed or absorbed Iranians, and later received influence from the Khazars and Vikings. The East Slavs trace their national origins to the tribal unions of Kievan Rus' and Rus' Khaganate, beginning in the 10th century. They came particularly under the influence of the Byzantine Empire and of the Eastern Orthodox Church. South Slavs from most of the region have origins in early Slavic tribes who mixed with the local Proto-Balkanic tribes ( Illyrian, Dacian, Thracian, Paeonian, Hellenic tribes), and Celtic tribes (particularly the Scordisci), as well as with Romans (and the Romanized remnants of the former groups), and also with remnants of temporarily settled invading East Germanic, Asiatic or Caucasian tribes such as Gepids, Huns, Avars, Goths and Bulgars. [ citation needed] The original inhabitants of present-day Slovenia and continental Croatia have origins in early Slavic tribes who mixed with Romans and romanized Celtic and Illyrian people as well as with Avars and Germanic peoples (Lombards and East Goths). The South Slavs (except the Slovenes and Croats) came under the cultural sphere of the Eastern Roman Empire (Byzantine Empire), of the Ottoman Empire and of the Eastern Orthodox Church and Islam, while the Slovenes and the Croats were influenced by the Western Roman Empire (Latin) and thus by the Roman Catholic Church in a similar fashion to that of the West Slavs. Throughout their history, Slavs came into contact with non-Slavic groups. In the postulated homeland region (present-day European Russia  and Ukraine), they had contacts with the Iranic Sarmatians and the Germanic Goths. After their subsequent spread, the Slavs began assimilating non-Slavic peoples. 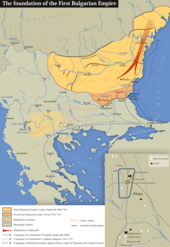 For example, in the Balkans, there were Paleo-Balkan peoples, such as Romanized and Hellenized ( Jireček Line) Illyrians, Thracians and Dacians, as well as Greeks and Celtic Scordisci and Serdi. Because Slavs were so numerous, most indigenous populations of the Balkans were Slavicized. Thracians and Illyrians vanished as defined ethnic groups in this period. Exceptions are Greece, where Slavs were Hellenized because Greeks were more numerous (aided by more Greeks returning to Greece in the 9th century and by the church and administration),  Romania, where Slavs settled en route to present-day Greece, North Macedonia, Bulgaria and East Thrace but assimilated, and the modern Albanian nation which claims descent from Illyrians. Ruling status of Bulgars and their control of land cast the nominal legacy of the Bulgarian country and people onto future generations, but Bulgars were gradually also Slavicized into the present day South Slavic ethnic group known as Bulgarians. 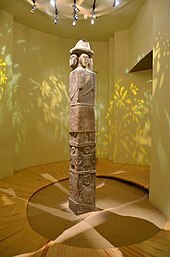 The Romance speakers within the fortified Dalmatian cities retained their culture and language for a long time. Dalmatian Romance was spoken until the high Middle Ages, but, they too were eventually assimilated into the body of Slavs. In the Western Balkans, South Slavs and Germanic Gepids intermarried with invaders, eventually producing a Slavicized population. 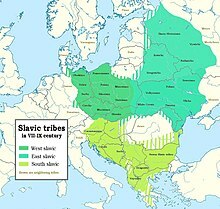 [ citation needed] In Central Europe, the West Slavs intermixed with Germanic, Hungarian, and Celtic peoples, while in Eastern Europe the East Slavs had encountered Uralic and Scandinavian peoples. Scandinavians ( Varangians) and Finnic peoples were involved in the early formation of the Rus' state but were completely Slavicized after a century. Some Finno-Ugric tribes in the north were also absorbed into the expanding Rus population. In the 11th and 12th centuries, constant incursions by nomadic Turkic tribes, such as the Kipchak and the Pecheneg, caused a massive migration of East Slavic populations to the safer, heavily forested regions of the north. In the Middle Ages, groups of Saxon ore miners settled in medieval Bosnia, Serbia and Bulgaria, where they were Slavicized. ^ Balanovsky, O; Rootsi, S; Pshenichnov, A; Kivisild, T; Churnosov, M; Evseeva, I; Pocheshkhova, E; Boldyreva, M; et al. (2008). "Two Sources of the Russian Patrilineal Heritage in Their Eurasian Context". American Journal of Human Genetics. 82 (1): 236–250. doi: 10.1016/j.ajhg.2007.09.019. PMC 2253976. PMID 18179905. ^ "Contemporary paternal genetic landscape of Polish and German populations: from early medieval Slavic expansion to post-World War II resettlements". European Journal of Human Genetics. 21 (4): 415–22. 2013. doi: 10.1038/ejhg.2012.190. PMC 3598329. PMID 22968131. ^ "Y-chromosomal STR haplotype analysis reveals surname-associated strata in the East-German population". European Journal of Human Genetics. 14 (5): 577–582. 2006. doi: 10.1038/sj.ejhg.5201572. PMID 16435000. Retrieved 25 January 2006. ^ Estimates range between 130 and 150 million. 111 million in the Russian Federation ( 2010 census), about 16 million ethnic Russians in post-Soviet states (8 M in Ukraine, 4.5 M in Kazakhstan, 1 M in Belarus, 0.6 M Latvia, 0.6 M in Uzbekistan, 0.6 M in Kyrgyzstan. Up to 10 million Russian diaspora elsewhere (mostly Americas and Western Europe).